Lovely! That colour is great. i love lush soap :) it doesn't get any better! the washclothes are really cute. i'm sure they made an excellent gift. I like the dark color you made yours. I made a few of these right after I bought the book and you're right; they're a little fiddly and take a little more time than you'd think, but they're so cute. I should do a few now that the Christmas rush is over. I know what you mean about this time of year. Back to work now. That pattern's a great idea. 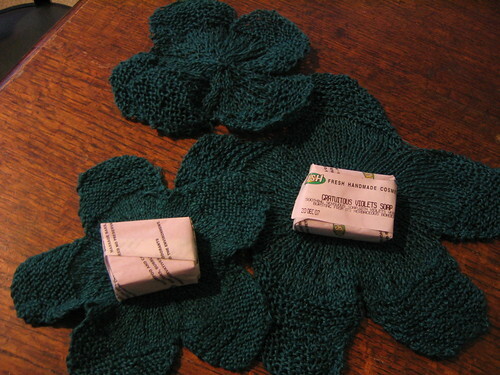 I must make more washcloths - always useful. Oooh violet soap! Mmmmm. Lovely match for a deep green too. these are so nice. 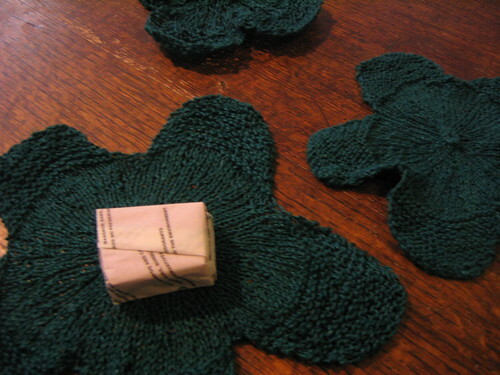 I have made a few of these out of Sugar & Cream cotton that I had on hand, and thought (with nicer yarn) that they would make excellent little gifts for co-workers or wonderful donations for our charity sales at work just as you presented them. Unfortunately I haven't been on the ball enough to get them completed yet. 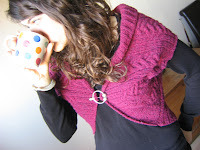 You reminded me again that I bought a skein of Mission Falls cotton to make one! Maybe I'll pull it out and get started so I'll have one ready when the next occasion presents itself!